THE GIRL WITH THE DRAGON TATTOO is a riveting Swedish "whodunit", a gripping mystery thriller based on Stieg Larsson’s international best selling novel of the same name. The odd-couple protagonists are a disgraced journalist and a young female computer hacker with a troubled past, who eventually team up to investigate the strange disappearance of an industrialist’s niece. The missing girl comes from a powerful family with closets to spare full of skeletons and secrets. They even throw in a dungeon of sorts... The film is completely engrossing and will have you on the edge of your seat for every minute of running time. The cast is uniformly strong, and aside from the performances of the actors, the Swedish countryside itself plays a prominent role. The look of the film is gorgeous and the cinematography is brilliant in creating mood and ambience. As befitting any good mystery, the film is filled with symbols, clues and foreshadowing that the writer and director have expertly woven into the movie. The direction is almost flawless, with dead on pacing and the sound track is eerily spot on. Be warned, if you run to the concession stand midway through the movie for more popcorn, you may miss a vital clue! The plot seems straightforward; forty years ago, sixteen year-old Harriet Vanger disappeared from a family gathering on the island owned and inhabited by the powerful Vanger clan. Harriet's body was never found, and the Uncle who has raised her like a daughter is convinced it was murder and that the killer is a member of his own dysfunctional family who acted in a bid to get back at him. He hires disgraced financial journalist Mikael Blomkvist (Michael Nyqvist), who in a strange twist of fate, was babysat by Harriet as a young boy. Lisbeth Salander (Noomi Rapace), is a brilliant but deeply disturbed computer hacker who was originally hired by the Uncle to investigate Blomkvist before he hires him. The heavily tattooed and pierced Lisbeth, with a secret past all her own, clearly identifies with the missing Harriet and is attracted to Blomkvist's journalistic track record of going after corrupt businessmen. She hacks into Blomkvist's computer and for the first part of the film is a shadowy presence operating in the background. When Lisbeth is the first person in forty years to unravel a crucial clue, she can not help herself and she feeds the information to Blomkvist. After a compelling confrontation between the two, and now flushed into the open, she agrees to work with the journalist. When the pair link Harriet’s disappearance to a number of gruesome ritualistic murders that date all the way back to the 1940's, they begin to unravel a grotesque Vanger family history. But the Vanger’s are a secretive clan, and Blomkvist and Salander are about to find out just how far they are prepared to go in order to protect themselves. Thrown together in their quest to bring Harriet's killer to justice, the middle-aged Blomkvist and much younger Lisbeth have enough chemistry to warrant their ending up as lovers. And along the way, we see the young hacker's enormous dragon tattoo, which not only comprises an entire back-piece of a dragon clawing its way out of her body, but also has its tail wrapped around one of her thighs. Going by the hacker tag of 'Wasp', Lisbeth has a large wasp on her neck, and a number of other tattoos on her forearms. Lisbeth is a woman with a powerful sting, which can only be fully appreciated by sitting through the movie. Be forewarned, there are a number of deeply disturbing scenes and some of the depictions of the work of a pathologically disturbed serial killer are graphically depicted. However, for those tattoo aficionados in the audience, Lisbeth's first foray into a career as a tattoo artist is sure to satisfy every woman's need for revenge. The two leads in The Girl With The Dragon Tattoo give stellar performances. Nyqvist is charming and sturdy as Blomkvist, nailing the dogged determination of the journalist with wonderful stubbornness. But Noomi Rapace is truly a revelation as Lisbeth Slander, portraying the troubled hacker as a youthful victim with such astonishing vulnerability that your heart goes out to her character. Yet the actress is so convincing and believable as an enraged avenger, that you can't help but draw back as she gives full rein to her anger, the dragon within. Dragons, wasps, fire and biblical passages galore as our two detectives follow a trail of murdered women across the decades and the Swedish countryside. You won't want to miss a second of this film. This one will be on many critics Ten Best Films of the Year list, you heard it here first! Director Niels Arden Oplev’s film version of Larsson's novel was Europe's biggest box office film of 2009, with ticket sales in excess of $100 million. Two other film versions of Larrson's other books in the trilogy, THE GIRL WHO PLAYED WITH FIRE and THE GIRL WHO KICKED THE HORNETS NEST, have strengthened the franchise. I can't wait to see the next two films. Join the Dragon Tattoo Blog HUNT - an internet wide scavenger hunt tied to the feature film launch of bestselling book The Girl With the Dragon Tattoo. Win great prizes – free movie tickets, books, movie soundtrack, posters and more. To join the contest, start at the beginning of the HUNT by visiting www.dragontattoofilm.com for full details and the first clue. The Girl With the Dragon Tattoo is in theaters near you starting March 19th. See a review of the film and the book it's based on. 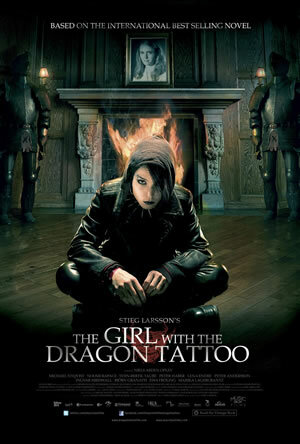 For more info about The Girl With the Dragon Tattoo see a photo gallery of images from the movie, a review of the book and check out the meanings of Dragon Tattoos, Fire Dragon Tattoos, Water Dragon Tattoos & Wasp Tattoos.